I’m currently on tourist duty in Dubai as my boyfriend’s family are over for a couple of weeks. 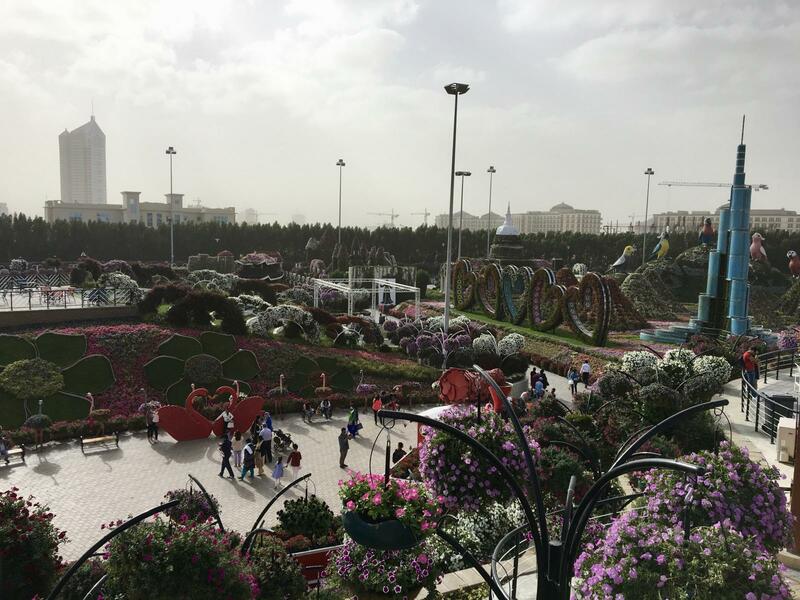 Although his parents have visited before, we decided to head out to visit the Dubai Miracle Garden. 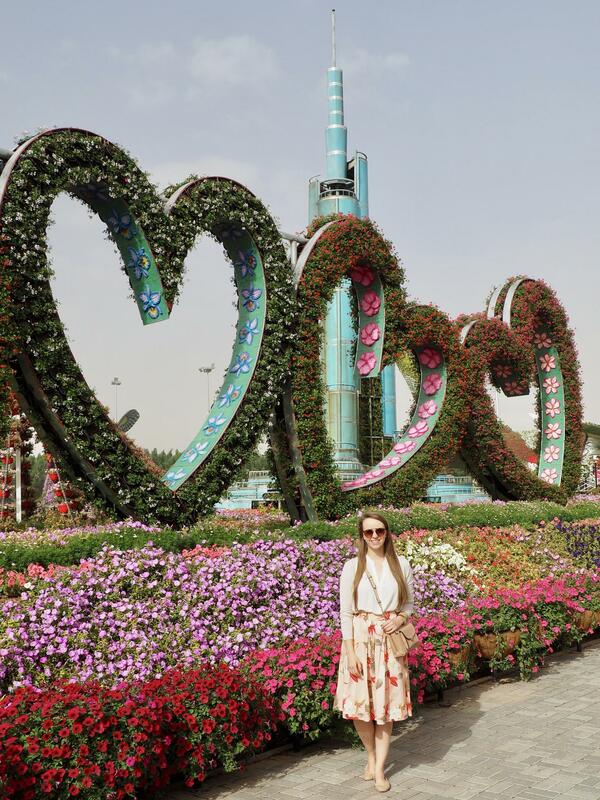 It was my second time visiting this desert flower garden, which is made up of over 109 million flowers, and spread over 72,000 square metres. 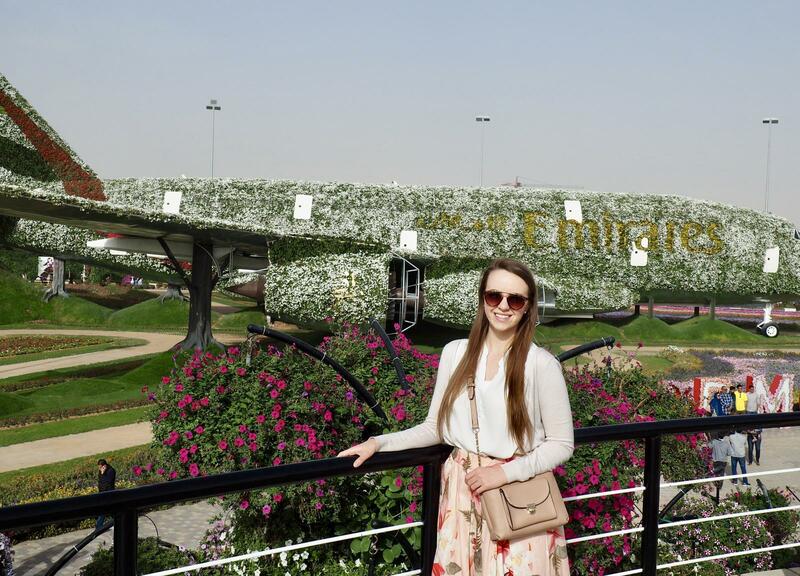 I visited with my sister Lizzie, her boyfriend Jarett, and my friend Kirsty’s husband Dan, who was visiting Dubai at the time. You can read about that trip here! 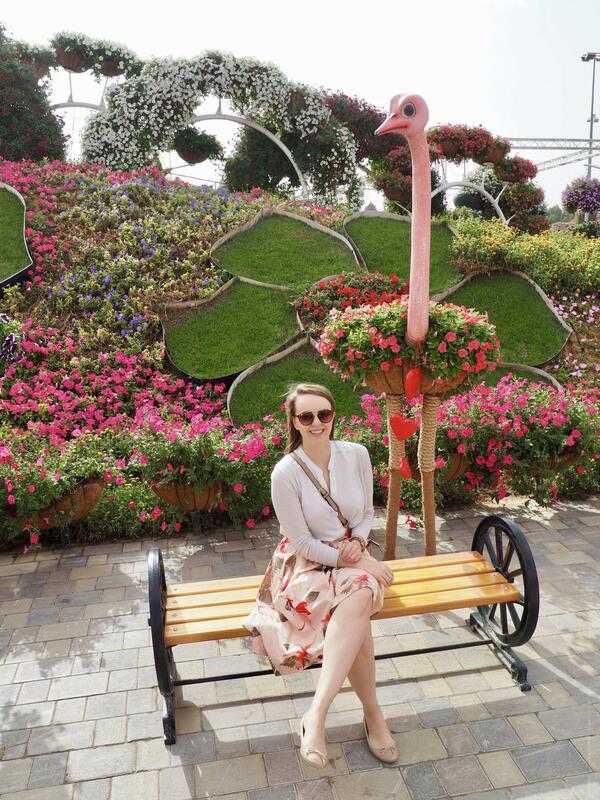 This time we headed out to the Miracle Gardens just after lunchtime, and despite the weather not being great (it’s been grey and cloudy, with temperatures barely reaching the 20’s for the past few weeks!) and it being a weekday, the tourists were out in full force! Since the gardens are only open from October – April due to the high temperatures in summer, now is the perfect time to visit. The whole layout has actually been changed completely since the last time I visited, and I have to be honest, I preferred it last year! The whole area just seemed too spread out, and not as many interesting sculptures this time. 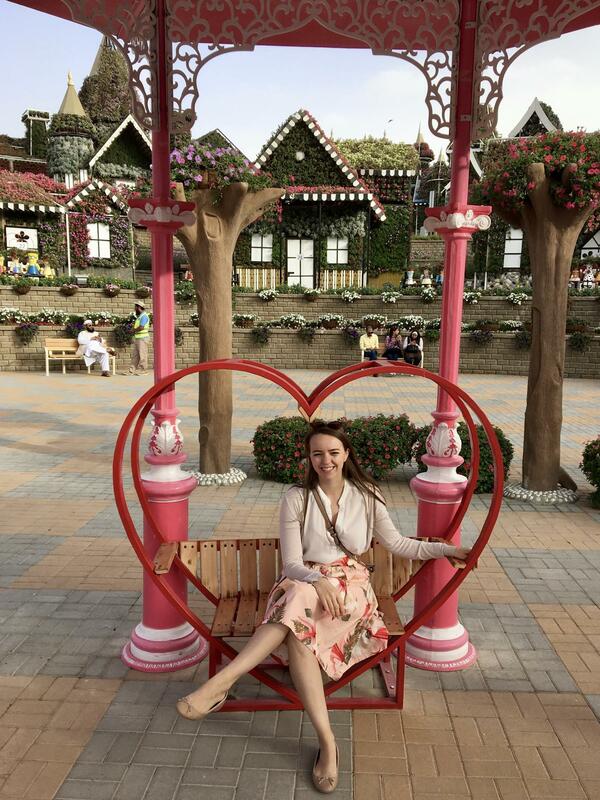 Nevertheless we took our time strolling through the gardens, and through the many heart shaped flower sculptures! 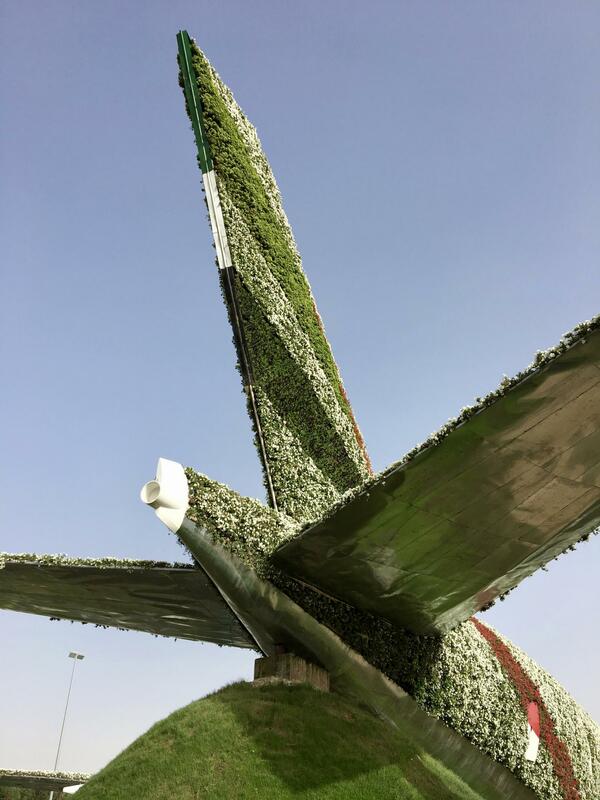 There are a few other pieces to spot, such as a model Burj Khalifa (last year it was made of flowers – this year it has a water feature) as well as lots of pretty miniature houses. 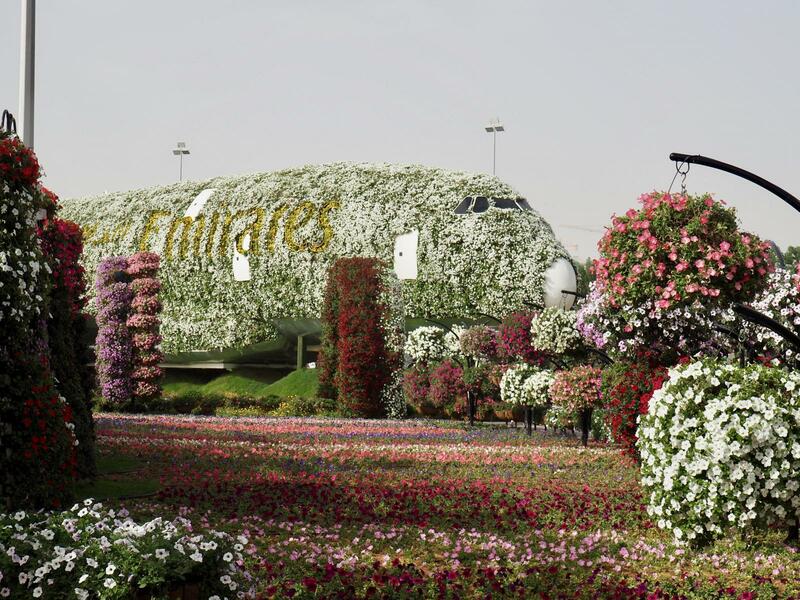 The life-sized sculpture is covered in more than 500,000 fresh flowers and living plants, and weighs over 100 tonnes! Fairly impressive, especially as even though I fly on the A380 all the time, sometimes I tend to forget just how big this aircraft is! We wandered up to the viewing platform, where you can look out over the whole gardens and to the city beyond. Since it was a rather cloudy day however, you couldn’t see too far! The sun did pop out for a little bit, so we popped into one of the shady covered areas for a rest and a drink. Lastly we stopped by the lower section, which has all of the pretty houses I remembered from last time I visited. 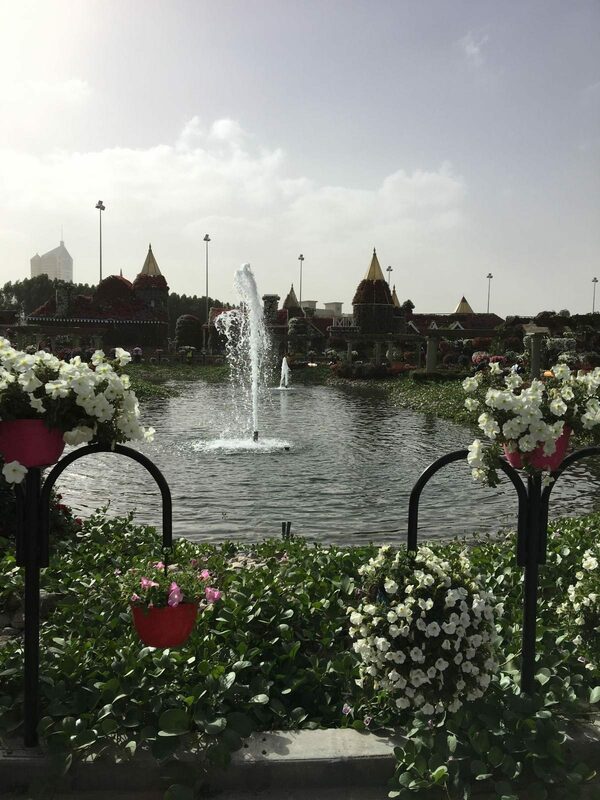 A lovely way to spend a couple of hours in Dubai, although I would recommend going earlier in the morning as it was pretty busy by the time we arrived at lunchtime. 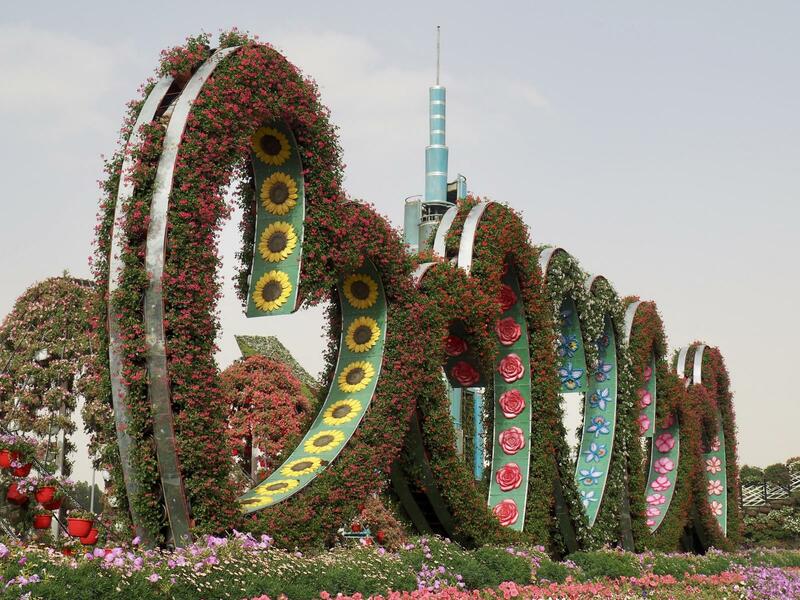 Entrance to the Miracle Gardens is 40 dhs per person, which in my opinion is a little steep, but that’s Dubai for you! It’s also better if you have a car, as it’s a bit of a drive from the city, out in the desert, so could be a bit pricey in a taxi. 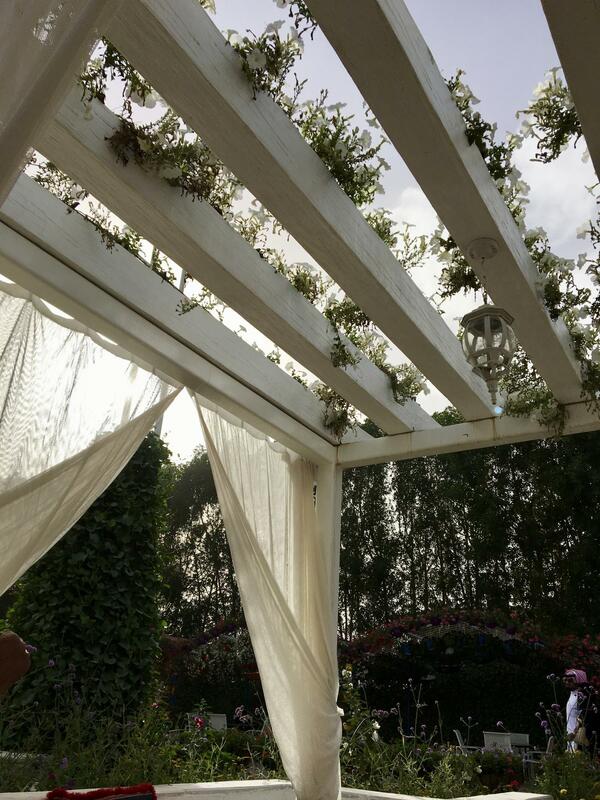 I am so glad that you have so deeply explored Dubai and entertained so many people there! The gardens are impressive!! Hope your (hopefully) future in laws were pleased with their visit to Dubai ….I am sure they must be delighted to see you again!! Wonderful post as always, Rachel! 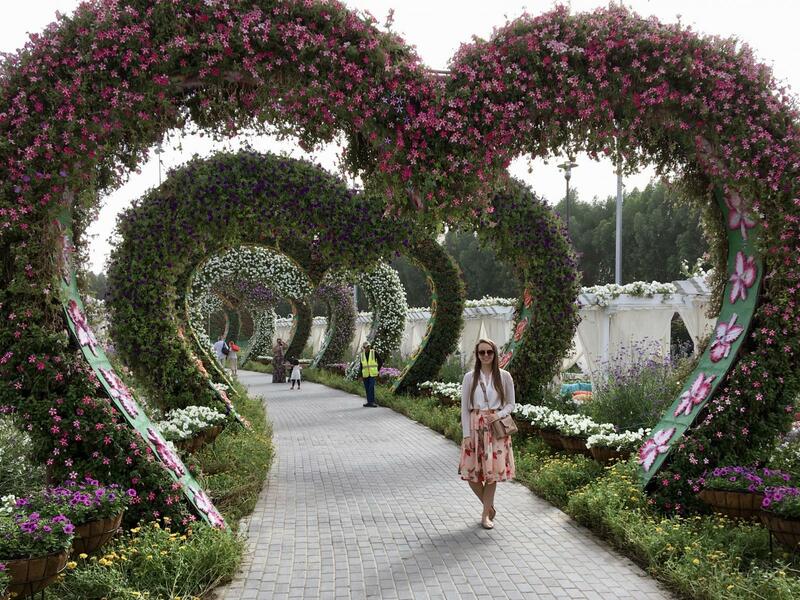 The garden looks absolutely amazing; I wish I could come and see it. 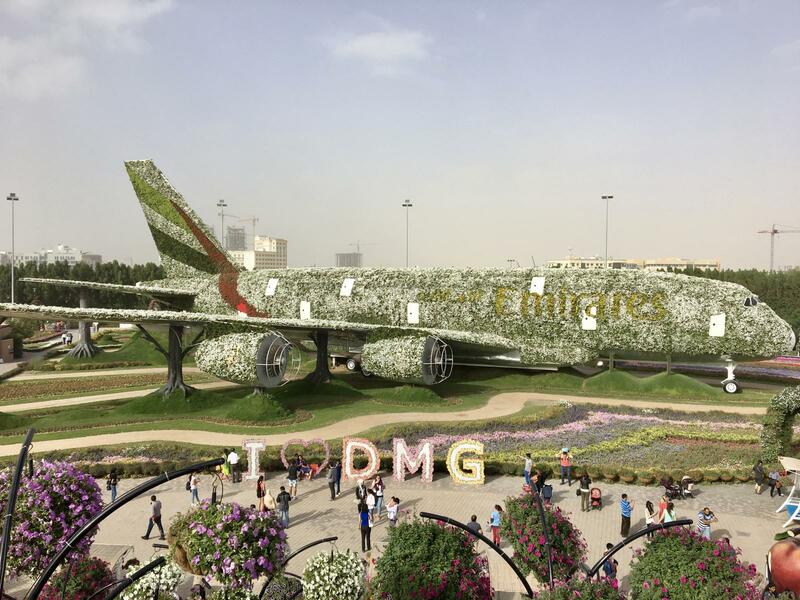 The Emirates plane is super cool! Sorry about that, I tried to post a comment, but it didn’t come through. So, I tried again, and now I have two! :/ Sorry! oh, wow!!! I LOVE GARDENS SOOO MUCH! i almost want to just catch the next flight out to dubai now for this!